A new Pew Research Center survey asked respondents an open-ended question (with multiple responses accepted): What do you like the least about Christmas or the holiday season? 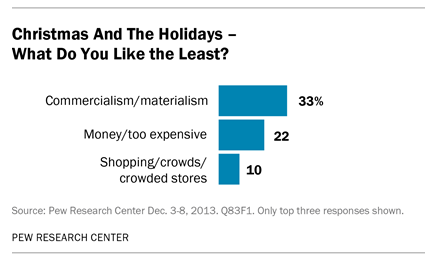 The three top responses all involve shopping or money: a third of Americans (33%) say they dislike the commercialism or materialism of the holidays; roughly one-in-five (22%) cite the high expenses of the season or the expectation of buying gifts; and one-in-ten (10%) mention shopping or crowded stores. Our Christmas survey also asked what people look forward to the most about Christmas. A majority (69%) say they look forward to spending time with family and friends. 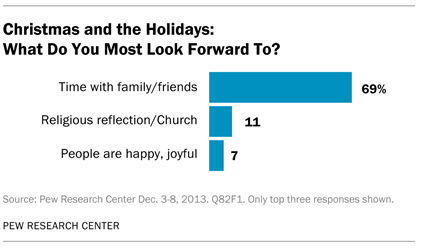 A smaller number say they look forward to the religious elements of the holiday (11%). By comparison, 4% cite giving or exchanging gifts, and 1% mention shopping.